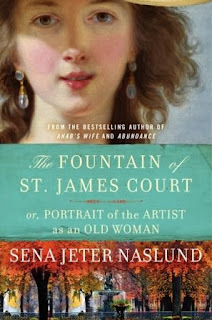 Sena Jeter Naslund's inspiring novel-within-a-novel, The Fountain of St. James Court; or, Portrait of the Artist as an Old Woman, creates the lives of a fictional contemporary writer and of an historic painter whose works now hang in the great museums of Europe and America. Both women's creative lives have been forged in the crucibles of family, friends, society, and nation. The story opens at midnight beside a beautifully illumined fountain of Venus Rising from the Sea. Kathryn Callaghan has just finished her novel about painter Elisabeth Vigee-LeBrun, a French Revolution survivor hated for her sympathetic portraits of Marie Antoinette. Though still haunted by the story she has written, Kathryn must leave the eighteenth-century European world she has researched and made vivid in order to return to her own American life of 2012. I have to be honest...this book was a chore for me to read. There is much to commend this book. Naslund has a beautifully poetic style and a very introspective point of view. I also really loved the "within" story of Elisabeth Vigee-LeBrun. I think if this book had just been that story, this would have rated among the best books I've read this year. For me the problem was with Kathryn's story, which is the more substantial of the two storylines. I was never able to connect with Kathryn and, frankly, I felt that nothing really happened in her part of the book. While I enjoy character-driven novels, I do think there should be some plot and that seemed to be missing with Kathryn. Part of my inability to relate to Kathryn might be circumstantial. She is a 70 year old woman and most of her story is about her looking back on her life. I still have a few decades to go before I reach that point so I just couldn't find any anchor with her. I am planning to have my mother, who is much closer to Kathryn's age, to give this book a try to see if her experience differs from mine. This is not a book that would turn me off any other works by Sena Jeter Naslund--as I said, I found her prose to be just lovely. But this one was really an uphill battle for me. I received an Advance Reader's Copy of this book in exchange for an honest review. I received no other compensation for this post. Monday, September 23rd: M. Denise C.
I'm glad to see that you enjoyed one of the two stories even though the other one didn't really work for you. Thanks for your honest review for the tour.